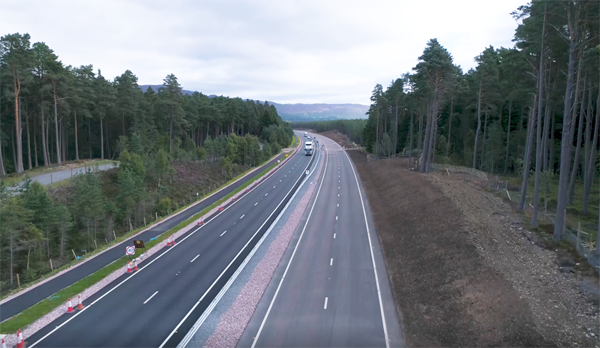 Three joint ventures remain in the race to build the next section of the A9 dual carriageway. Economy secretary Keith Brown announced the contenders for the £100m, 9.5km stretch between Luncarty and Pass of Birnam this week while on a visit to the £35m Kincraig to Dalraddy section (pictured) which is coming to a close after a two-year construction programme. Companies bidding for the latest contract, which is expected to be awarded in the first half of next year, are Farrans Construction with Roadbridge; Wills Bros. Civil Engineering with Lagan Construction Group; and Dragados S.A. with Balfour Beatty Civil Engineering. Construction-related traffic restrictions on the Kincraig to Dalraddy stretch will be removed once various finishing works have been finalised and safety audits are completed. It’s being built by Wills Bros Civil Engineering and John Paul Construction as part of a joint venture.